60 More Miles to Beat Breast Cancer – And Pink Sweets to Come! My mother Doris and I in the Twin Cities in 2011. I say the word “walk” a lot. To my dog, several times a day. To myself when I’m cranky at how slowly some people move on the streets of NYC. As a curse when my joints really hurt (yeah, this Nemo character isn’t helping today). And within my family as we talk about if we should do a “walk” or not this year. The joy of the word and its meaning is not lost on me, since there was a time as a child Lyme Disease made it not possible for me to walk. Over the past 20 years, this ability has ebbed and flowed in regards to ease. 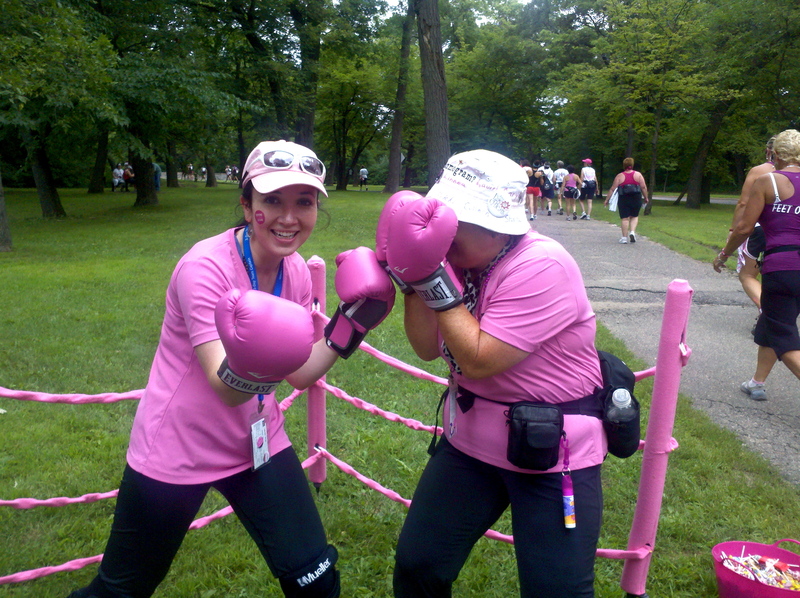 And in 2004 I first put my capabilities to the test in what was to be the last of the Susan G. Komen for the Cure New York City Breast Cancer 3-days. I walked 60 miles from Bear Mountain through the Bronx and on the Triboro into Queens, then again down into Brooklyn, over the Williamsburg Bridge into Manhattan, ferried it over to Staten Island, and then finished off the Bayone to Jersey. 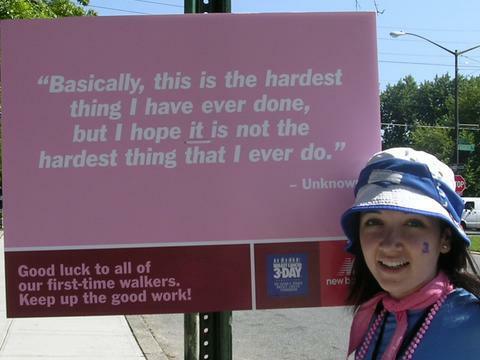 I made every step, and was so moved that I vowed to walk every city the Komen organization sponsor. I walked every step in 7 cities after that, recruiting family members and friends over the years. My illnesses challenged the “every mile” goal I’d had after I dealt with another bout of illness in 2008, but I still tackled two more cities in 2010 and 2011, first celebrating my father’s 60th birthday by walking with him in Phoenix and then with my mom and sisters in the Twin Cities. This year my mother and I will once again walk, “60 Miles for 60 Years” being our motto as we celebrate her significant 60th birthday. She’s the reason why I picked this walk. Seeing her support her friends and loved ones as they battled breast cancer over the years made me so thankful – both for my health and for the attention she’s given me as I’ve needed her support maybe more than most kids should. To this day she’s one of my strongest advocates, and walking with her is one of my greatest joys. So together we’ll walk Seattle this coming September, with my siblings all on various crew teams in celebration. We’ll walk in laughter and tears for those we’ve loved, those we’ve lost, and those we’re walking to save before they need saving. We’ll celebrate her birthday, our friendship, and the thousands of people we’ll walk with. I’ll make as many steps as I can, and be cheering for her as she pounds miles I can’t. We’ll keep working hard to raise more than money – to raise awareness, unity, and solidarity. I so can’t wait to walk. If you feel so moved, please donate to help us achieve the $2,300 fundraising minimum we need to meet on top of our own personal travel funds to get to the starting line by clicking HERE or on the widget to the right. And check out our website, Walking for Udders, to see pictures and read stories from our last 9 walks. And expect lots of pink sweet things to come in the next 7 months. It’s inspiring to hear why you walk, and how you’ve been motivated to keep giving & walking for others. Good luck on your 60 miles for 60 years to you and your mother. Time to bust out all our pink!!! I’m so excited to partake again this year and excited to be a part of it with my amazingly wonderful mother and siblings. Yay 3Day! Congrats on all your walks!! I haven’t done a walk yet, but have had many friends who have. I’m not sure what my excuse is – I live in San Diego, so no excuses there!! Anyhow, best of luck to you!